← Ni’s Illustration Today Interview:My Experience As A Self-Taught Aritst in English Verision! Inspired By Nature: Ni’s Handwritten Chinese Calligraphy on Leaves!! © Ni Carnahan 2013. All Rights Reserved. 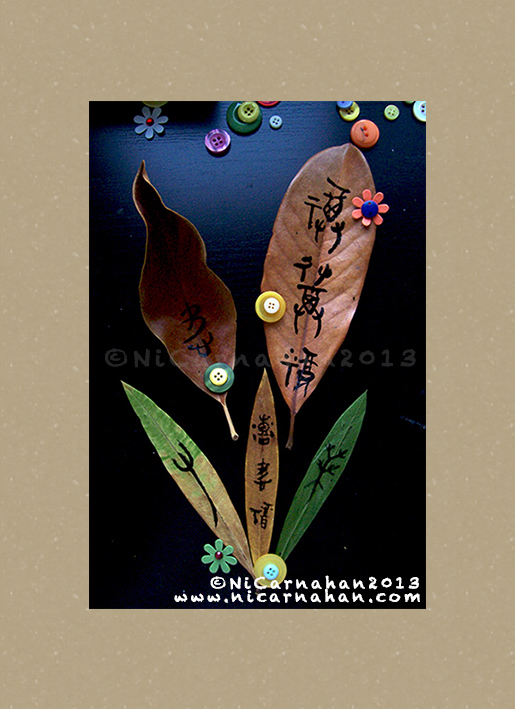 Ni’s handwritten Chinese calligraphy 書法 on leaves 2013. Today, I was in mood of trying something different when I tried to practice my Chinese calligraphy 書法. I love collecting leaves on my walk,so I have many different types of leaves on my art table. I am fascinated by all different shapes and colors of leaves. I wish I knew all of them by names. Well, I am learning as I go! I am lucky enough to have a book called Eyewitness Handbooks-Tree to help me identify any kind of leaf that I collect or wish to know more about from time to time. As always, Nature inspires me to create !! Like I said I was in mood for something different after working on coloring my illustration titled “Reborn with Love“. So, I spent all day getting my hands messy with Chinese brushes and ink in order to practice my calligraphy on the papers. Then, I played around and put my handwritten Chinese calligraphy 書法 onto these leaves. It was my first tryout, and I had so much fun doing it. It brought me joy and peace when I created them. The top two big leaves are Magnolia leaves that we have around our neighborhood. Magnolia’s leaves were big, so I had more rooms to work on. The surfaces were much easier to apply Chinese ink on. The bottom of three leaves are Spinning Gum if I am not wrong. These were much harder to apply the ink works on the surfaces. Anyway, I was going to sketch them for my Inspired By Nature sketch series,but I ended up putting my handwritten Chinese characters on them instead. As Fall is around the corner, I am looking forward to collecting all the colorful leaves off the ground on my walk.